The new Mezzmaster responsive SEO website puts a bold, fresh face on the extensive manufacturing operations services offered by Westhead Associates. DDA first designed the Mezzmaster website in the ‘90s, and it was quite light on content, so it was in real need for a total overhaul. Westhead Associates, the company behind the Mezzmaster name, decided it was time to catch up once it learned that Google would begin penalizing websites that did not have a mobile-optimized presentation available. In addition to building a new, contemporary responsive website design, with updated branding and aesthetics, the new website would also become a full search engine marketing platform with keyword-rich content targeting those seeking storage and other structural solutions for manufacturing operations of all kinds. This space is highly competitive, so nearly 40 new pages of original SEO content would be authored by DDA’s own SEO copywriters to help the website compete for rank for key search terms. DDA began with a comprehensive keyword research and competitive intelligence campaign, learning from what other players in the market were doing to achieve rank and finding the keywords that were most likely to attract the customers Mezzmaster was looking for. Once keywords were ranked by the client to reflect priorities, a new website architecture was outlined to show how the new content would be organized within the hierarchical navigational structure of the website for usability and maximum search engine results. It was critical that the website reflect the expansion of the Mezzmaster business into more functional aspects of manufacturing operations, especially including controlled environments (cold and clean rooms) made affordable with modular insulated metal panel systems. The website would include dozens of new project photos and highlight a particularly successful project made possible by Mezzmaster’s new focus on IMP systems. Once the navigational structure was finalized and approved, DDA created a content development plan mapping out how keywords would be used on each page, both within the title and text, as well as in meta data, to help achieve good rankings for key industry search strings. DDA received dozens of new high resolution photos and organized these images based on the site structure. DDA authored nearly 40 new SEO pages for the website on the full range of Mezzmaster manufacturing operations services. DDA also integrated a customized content management system (CMS) to allow the client to add case studies and other content over time, helping audiences keep informed while adding SEO value in the long run. 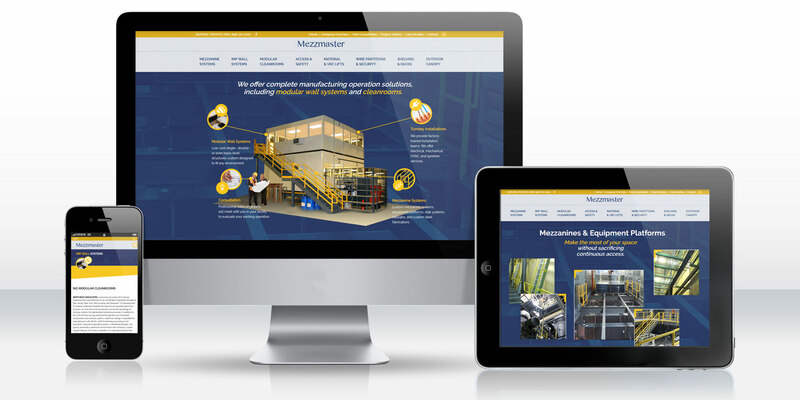 The new responsive design was incredibly contemporary, with bold contrasting yellows and blues along with sharp, defined angles that reflect the rugged strength of the mezzanines, cleanrooms, and other storage and operational solutions for manufacturers produced by Mezzmaster. The homepage has a bold rotating image presentation, beginning with an animated breakdown of one of the more diverse projects in his portfolio with highlights pointing towards the specific custom-designed manufacturing operations structures produced by the company. Other rotating image presentations highlight specific high-demand service offerings. The homepage presents the turnkey nature of Mezzmaster services, and also includes a very full gallery of project photos that can be filtered by type. A contact form is included on every page to facilitate lead generation, and the menu system locks in place for easy navigation at all times. Critically, the website presents perfectly on all devices and screen sizes, allowing it to capture the growing audience of website visitors using smartphones. The new search engine optimized website, with its responsive design, extensive high resolution photography, and organic SEO content, functions as a bold call to action for those seeking warehouse and manufacturing solutions in today’s competitive market.